Any impartial observer unfortunate enough to visit Imo State today will be forgiven for thinking that Hitler's Third Reich has been resurrected in the peace loving central region of Biafraland. 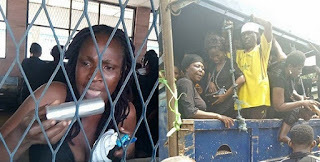 The gestapo style round up of innocent mothers during a peaceful protest, their unlawful detention by the government, ongoing torture and humiliation of the entire Igbo race, has taken another more sinister step. The forced pregnancy test for all the women including grand mothers, announced by the prison authorities, is a devilish and sinister intrusion into the health of our mothers reminiscent of the fate Jewish women endured in Concentration Camps in Europe during the Holocaust. That this is allowed to happen in the 21st century, is an indictment of the impotency of United Nations, Britain, Africa Union and countless other human rights groups that receive aid and grants to defend human rights but only end up aiding gross violation of human rights in Biafra. Who in their right mind will subject a 64 year old woman to a pregnancy test, if not for the purpose of humiliation and inflicting of bodily harm. We the worldwide family of the Indigenous People of Biafra (IPOB) wish to notify the world that plans to subject our women to invasive and undignified pregnancy test is a genocidal medical experimentation we will not allow to be performed on our mothers. No pregnancy test will be conducted. The best option remains for the government to release our mothers unconditionally so they can seek independent medical attention elsewhere. It is common knowledge that this Buhari regime has done and is still doing everything within its powers to eliminate as many Biafrans as possible. The mass murder of IPOB family members by Buratai's Nigerian soldiers in Igweocha (Port Harcourt), Nkpor, Enugu, Onitsha, Aba, Umuahia, Mbiama Bayelsa State is still fresh in our memory. This latest plan to forcefully subject our mothers and grand mothers to pregnancy test is part of a wider ploy to contaminate and infect them with diseases that may prove incurable in the long run. We ask that Imo State government desist from this deadly medical experimentation on our mothers. It's important to note that our mothers, wives and sisters are not in any Nazi concentration camp or Gulag archipelago yet, though Nigeria is speedily heading in that direction. Imo State government under Okorocha will go down in history as the first administration in Nigeria to lock up old women and nursing mothers for merely exercising a constitutionally guaranteed right. In Northern Nigeria where his father comes from, they rarely see women talk less of touching or locking them up. If women from the north where Rochas Okorocha comes from cannot be arrested and detained, why then is he doing it in Imo State his maternal home state? Certified Fulani terror groups like Miyetti Allah Cattle Breeders Association, their militant wing the Fulani herdsmen are immune from prosecution but innocent Igbo mothers can be locked up, brutalized and experimented upon. How long are we Biafrans going to put up with this collective insult and satanic attack on our women and Biafran people in general? Nigeria is an Islamic and violent state. We can only extricate ourselves from this abomination called Nigeria and their slave master - Britain not with peaceful protect but with equal violence. Freedom is not given, it is taken by force. Peaceful pretest will never work in the present Nigeria under a tyrant and Fulani jihadist. It's time to rethink our strategy. This insult and attack to exterminate us is getting out of hand. We can no longer take it anymore. Nigeria has reached a breaking point to be destroyed this hell of a place.